The Outdoor Combi Standard CODC1 is a floor-standing, condensing, Combi oil boiler that has been designed and manufactured by Mistral. Providing a highly efficient unit was an important part of Mistral’s mission with the Combi Standard CODC1, and is shown by the 92% efficiency that makes this an A-rated boiler. 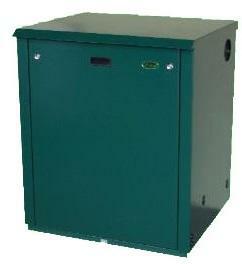 The output rating of 15-20kW and a flow rate of 13 XL help to make this a reliable boiler. Being an outdoor boiler means that it needs protection with the elements all year round. The Combi Standard is housed in a fully-insulated, weather resistant casing, with the casing also being zinc phosphated for maximum protection from corrosion. To prevent the boiler from freezing during the winter, a frost stat has been fitted as standard. In addition to this, the unit has a polyester coat that has a green texture finish helping it to blend in with the surroundings. It’s been claimed that this boiler is able to produce twice as much hot water as any other Combi on the market. More features include a multi-directional flue, pre-punched pipe and entry points from the back and both sides, and with it featuring a stand alone unit, installation is made quick and easy to help save you money. A lockable cabinet door has been fitted for extra protection and it can be serviced without the need to access the residential area of the property. As well as this, it features a tandem operation and has no internal oil line. Available with a standard 2 year warranty on parts and a 5 year warranty on the heat exchanger, plus the backing of the Mistral guarantee of quality, and you’ll be well covered in the unlikely event that anything goes wrong.